Childhood cancer survivor hopes to use his newfound celebrity status to raise awareness for childhood cancer through Gabe’s Chemo Duck Program. 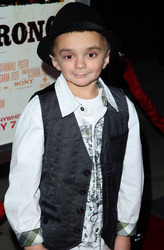 Beverly Hills, CA — 8-year-old actor and childhood cancer survivor Gabe Sipos celebrated his acting debut by walking the red carpet at last week’s Beverly Hills premiere of his upcoming feature film, “Country Strong.” The Screen Gems release opens in Los Angeles and Nashville on Wednesday and nationwide on January 7th. Now cancer free, Gabe is enjoying his newfound celebrity status, thanks to his breakout role opposite Gwyneth Paltrow, in which he plays the role of Travis, a Make-A-Wish child who Gwyneth’s character visits during a concert tour. Gabe joined co-stars Gwyneth Paltrow, Tim McGraw, Garrett Hedlund and Leighton Meester for the premiere at the Academy of Motion Picture Arts and Sciences, and mingled with producer Tobey Maguire and VIP guests that included Faith Hill, Reba McEntire, Minka Kelly, Kristin Cavallari, Trevor Donovan and many more. Gabe hopes that his acting debut will bring awareness to his nonprofit organization, Gabe’s My Heart – an organization based in Spring Hill, Tennessee, that provides therapeutic play tools to children living with cancer through Gabe’s Chemo Duck Program. Chemo Duck, which was created by Gabe’s mother, Lu Sipos, when Gabe was going through his cancer treatment, is a cuddly pal who exposes children with cancer to their new life and encourages healing through the power of play therapy. Gabe’s Chemo Duck Program has provided more than 5,000 ducks to children around the world. A donation of $30 provides a Chemo Duck to a child living with cancer.